Cardiology is the branch of medicine dealing with disorders of the heart and blood vessels. The field is commonly divided in the branches of congenital heart defects, coronary artery disease, heart failure, valvular heart disease and electrophysiology. 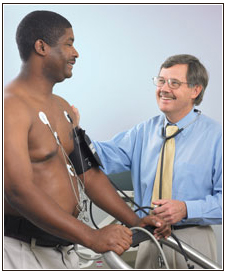 Physicians specializing in this field of medicine are called cardiologists. Cardiologists provide continuing care of heart patients, doing basic heart-function studies, supervising therapy, including drug therapy, and working closely with heart surgeons. Beaver Medical Group's Cardiologists offer cardiac diagnostic testing including stress testing and echocardiography on-site at the Redlands and Banning facilities. Learn more about cardiac testing.